Win 1 of 2,000 USA Kids’ Sippy Cups! 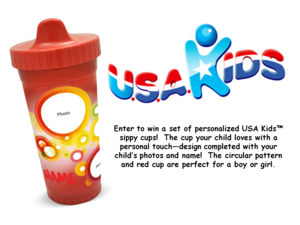 Grand Prize: One grand prize winner will receive a set of personalized USA Kids sippy cups customized with up to 3 photos and the child’s name! 2nd Prize: 2,000 randomly selected entries will receive a FREE USA Kids sippy cup!